The author in green shirt on his bike during CicloSDias. Along 30th Street I saw many fancy bikes with riders dressed in those colorful skin tight outfits. I also saw some unique forms of self-propelled transportation. I was hoping see folks wearing regular clothes as if they were going to school or work – but then it was Sunday plus CicloSDias is only once a year at that. Given the agreeable weather, San Diego has been a great place for recreational biking. In the 70’s a familiar (now unfriendly) voice advocated for building bike paths and adding bike lanes. Roger Hedgecock had some success, including getting a path around San Diego Bay built that was recently expanded and improved. Bike friendly policies were promoted. So workers could ride to work employers were encouraged to provide shower facilities and bike storage lockers. I rode 7 miles to work, for a while. Taking a shower at work was less than pleasant. But sharing the road with trucks and buses proved to be the undoing. A few near death experiences and I swore off the white paint bike lanes as suicidal. That was then. Thirty years passing and the bike culture seems stuck in first gear. The bike is used by very few as a practical transportation tool. The economic collapse of 2008 forced many to give up their car and go to a bike, still the percent of commuters who depend on bikes is very small. For the San Diego Bike Coalition and others to succeed requires biking to mature from a recreational activity to a practical daily means of getting from point A to point B. There are cities around the world that rely on bikes for daily transportation. I remember my grandmother telling about her visit to her place of birth in Denmark. At 98 she rode bikes in Copenhagen. I was surprised if not shocked that my 98 year old grandmother had the inclination let alone the physical ability to ride a bike. Why I asked? Because she said, “that’s how you get around, in Copenhagen.” Copenhagen has roads dedicated to bikes. They have bike traffic jams, intersections, roundabouts, bridges and tunnels. As a rule they do not share the road with 2 ton vehicles. 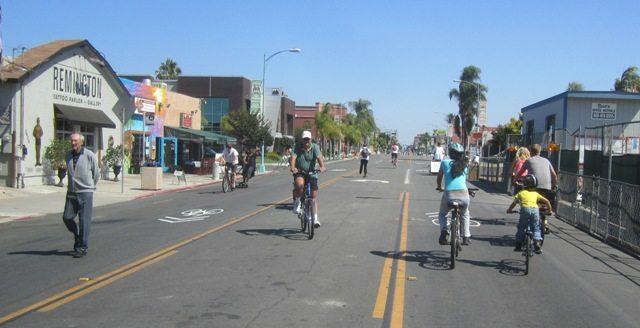 Biking in San Diego struggles for space; competing with motor traffic for road space. 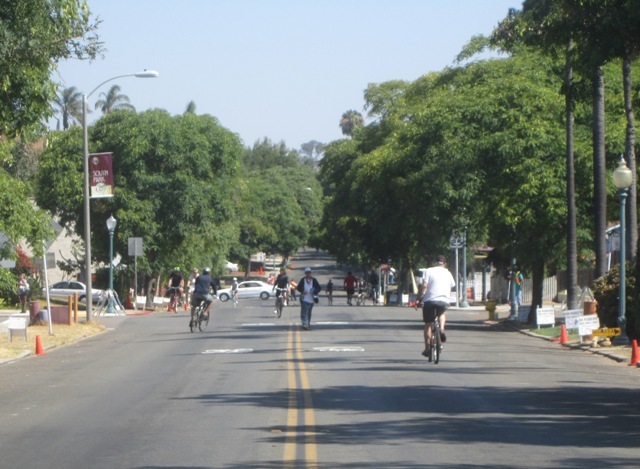 Proposals focus on carving dedicated bike lanes out of existing streets. Streets that were originally designed to carry motor vehicles. This contest for space is likely to force compromises aka more painted on bike lands. For me CicloSDias brought into focus this brewing contest between the aging car culture and the newer, wants to grow up bike culture. Each arm wrestling over who gets to use the streets. There is one undeniable fact; we will evolve from where we are. Motor vehicles, whether electric or gas, will be with us for the foreseeable future. But is there any reason to wait? I think not. I think there may be a way to avoid an out and out fight with the car culture while giving to bikes dedicated pathways and the means to mature from a recreational pastime to a practical and normal means of daily transportation. Once in place I believe many drivers will see an advantage and get out of their cars. Here’s an idea; dedicated Bicycle Expressways. Take a look at San Diego from Google Earth. Notice the many finger canyons that spread across the city. A Bike ‘road’ need only be 8 feet wide and doesn’t need to hold the weight of a semi-truck, only people on bicycles. Road beds and their supports can be pre-fabricated and installed with little or no grading. And, as a ‘road’ dedicated for bikes, special attention can be paid to creating a level road for ease of travel while maintaining the natural contours and vegetation of the canyons and ravines. A ride to work could be pleasant and, with a level ride, could be free from sweat – no shower needed. For example, one path, from North city to Old Town could follow Tecolote canyon; another from 32nd and Redwood to Downtown via the golf course. Considering a standard street requires 40 foot and the strength to hold 8 – 10 tons, a bike path needs only 8 feet and to hold less than one ton of weight. Laying down a new path dedicated to bikes can fit into places long ago dismissed as insufficient for a street. Ok, that brings us to the tough question – money. Let’s face it, we end up with paint on a street because it’s cheap and easy. But, as the saying goes, you get what you pay for. Buy cheap, get cheap. And this idea is not cheap, compared to paint on asphalt. As a recreational activity many sources of public money are not available. But as a public transit project; as a companion to trolley and bus systems, transit money could be available to help construct dedicated Bicycle Expressways that might conceivably move traffic off of the freeways and onto the bikeways. Billions are spent on roads every year. With just a small share of those funds, San Diego could create a network of Bike Expressways to serve the city for the rest of the century. I look forward to hearing your comments. This first appeared at OB Rag. world would pay for them? Something doesn’t quite sound right with that. Also, the canyons are nature’s drainage system, and maintenance against water damage (and root uplifts) would be costly. But, hey, we’re turning into a developing nation. The rich can have electric cars and we can have bikes. Money – always central – how much do drivers pay to drive roads? Why charge bikers? No need – as a transit project, funding sources are available. Water drainage, root uplifts, not a problem – suspend the path above the dirt. Plenty, in the form of vehicle registration fees and more importantly, fuel taxes. That is what seems to be flying over your heads, the reason politicians have only made weak gestures toward bicycle infrastructure is the same reason we don’t have 50 mpg cars- we’d use a lot less fuel and they’d have a lot less money in the coffers to use (and abuse). Oh you can kick and scream at them and they will come out at ribbon cutting ceremonies for a bike lane of doom alongside a busy thoroughfare… when they’re back in their office they’re having a chuckle at the silliness of spandex-clad proletariat pedalers thinking the people really do control government. For the record I’d ride my old Klein roadie everywhere all the time if it were safe and I could get a good deal on a Dura Ace 12-27 (AKA old man’s cassette) on ebay to get up these hills without the embarrassment of a walkup. Every time a used one comes up it’s a bidding war. We’re all getting older. also advocate designating one lane of some roads to just bikes/pedestrians, like Nimitz, an easy cross over hill through Point Loma from downtown and San Diego Bay and the airport, etc, to Mission Bay and the beach communities which has no sidewalks and encroached bike lane..